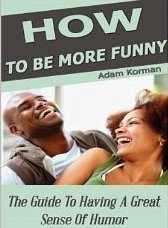 This book explains why having a great sense of humor is so important and contains proven steps and strategies on how to be more funny. It is a short read designed to give you the necessary information and practical steps you can follow, in order to make your life more fun and enjoyable. By following these simple steps you can develop your sense of humor which will help you having more friends, having better relationships and many more. Great self help book, it is always great to grow whether you're already charming or have no charm at all. This book was motivating and had great suggestions of ways to be more Charismatic and funny.